Kempinski Hotel Mall of the Emirates is a luxury 5-star hotel in Dubai adjacent to the Mall and indoor ski slope, where the hotel juxtaposes the alpine slope and desert landscape in a unique environment. After the hotel underwent renovations in 2014, the project addressed the new Arabic Gallery, which connects the hotel lobby to its Spanish restaurant, Salero Tapas & Bodega. The client’s intent was to enhance the experience of their guests and introduce them to Emirati culture during their stay in Dubai. 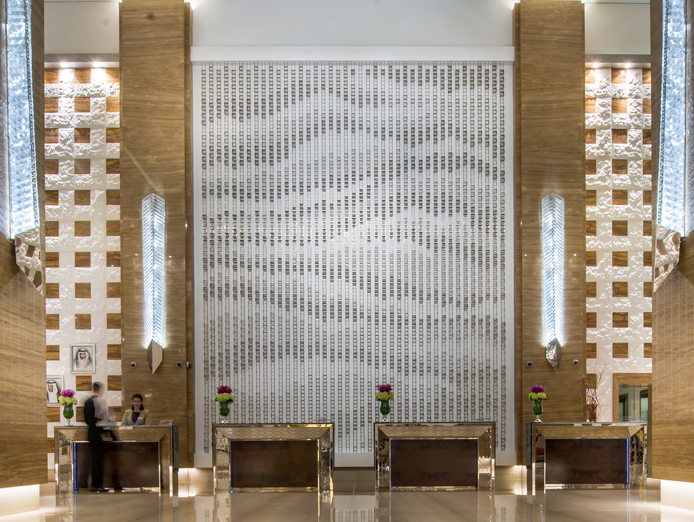 This was achieved through a series of bespoke paintings commissioned by an Emirati artist for the hotel's Arabic Gallery. Emirati artist Mohammad Al Qassab was commissioned to create two large-scale original paintings on canvas inspired by the UAE’s heritage and design. His use of geometric shapes and patterns can be traced back to traditional Emirati architecture, and a popular local fabric called Sadu. He coupled these elements with a vibrant colour palette inspired by the Arabian desert. Informative plaques in Arabic and English were installed alongside the two paintings, giving viewers insight into the inspiration behind Al Qassab’s artworks. Mohammad Al Qassab is a member of the Emirates Fine Art Society and lives and works in Sharjah. He has participated in exhibitions within the UAE and internationally, most notably in Kuwait, Bahrain, Korea, Italy, and India. His works also feature in our limited edition art print collection.